The nonwhite population has doubled and segregation has decreased as the Atlanta metropolitan region has grown by more than 300 percent over the past 45 years, according to new research by the Center for State and Local Finance at Georgia State University. Now, more than 5.7 million people call metro Atlanta home. The Atlanta metropolitan statistical area has morphed from just five counties to 29, sprawling across 8,376 square miles, an area nearly the size of New Jersey. However, metro Atlanta's evolving and increasingly diverse population most strikingly shows the dramatic transformation from 1970-2015, the study finds. The nonwhite population doubled, increasing from 22 percent to 44 percent. 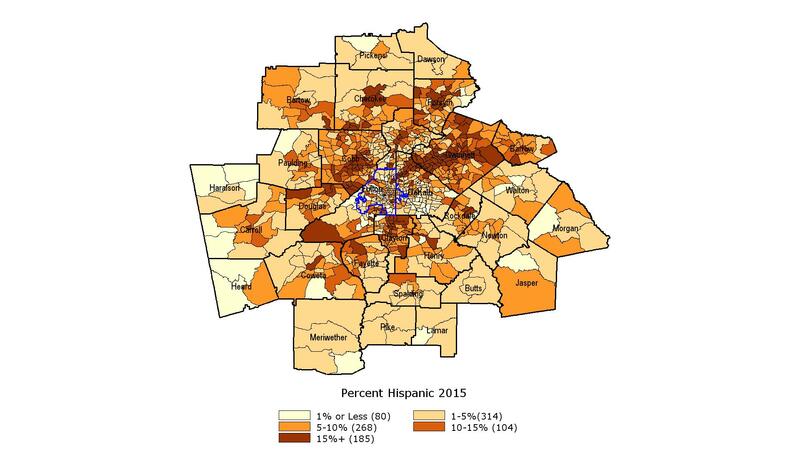 The Hispanic population, for example, generally accounted for less than one percent of the population across metro Atlanta counties in 1970. In 2015, many counties had a Hispanic population of 10 percent or more, most notably in Gwinnett County where Hispanics were 20.3 percent of the population, more than any county in metro Atlanta. The level of segregation has decreased across the entire area, meaning people of different races and ethnicities are living more and more in the same neighborhoods. The research points out there are relatively fewer children in metro Atlanta than before, with a precipitous drop over time in the percentage of households with residents ages 1-17. The data also illustrate that many metro Atlantans are simply aging in place, with the trend manifesting more in the outer suburbs. Other trends include more residents earning at least a college degree and a shrinking middle class, with more families in the high-income category. The researchers used the data from the U.S. Census Bureau to complete the study. To read the report and view a series of 70 maps (illustrated separately and also combined in a dynamic feature), as well as additional charts about Atlanta’s changing demographics, visit this webpage: http://cslf.gsu.edu/changing-face-atlanta/.